Rotary transfer machines are advanced machining centers with modular plug and play spindles oriented circularly around an indexing head. Each spindle can handle any of the common machining operations, including milling, drilling, tapping, and chamfering. Most rotary transfer machines feature 12 to 16 independently operating stations with collet and spindle, essentially providing 16 simultaneous machining operations with automatic changeover within a single machine. 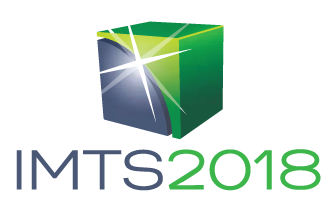 These stations can be interchanged and customized to provide a complete turnkey machining system for incredibly high production jobs. Rotary transfer machines can turn any complex machined part, especially any part requiring production in the millions. They save huge amounts of floor space, maintenance costs, and set-up time, as up to 16 machines may be combined into 1. 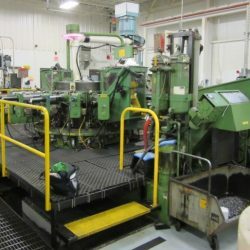 Each station on the machine is plug and play and completely customizable, meaning that a rotary transfer machine is essentially a single turnkey solution for an entire manufacturing process. Because up to 16 parts can be machined in multiple stages at once without any changeover, supervision, or set-up time, they are superlative high-production machine tools. For answers to your questions or more information on rotary transfer machines call Liberty at 847-276-2761 or send us an email sales@libertymachinery.com. Liberty Machinery buys and sells all types of rotary transfer machines. 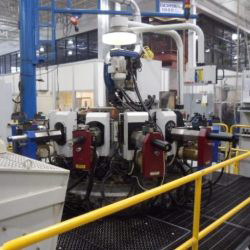 We are your trusted source for high quality used Hydromats & other rotary transfer machines. 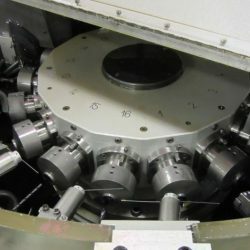 A rotary transfer machine is a complex piece of equipment, but the process can be broken down into the following components: the rotary indexing table, the collets mounted in the table, and the independent machining stations surrounding the table radially, each with spindle and tooling. 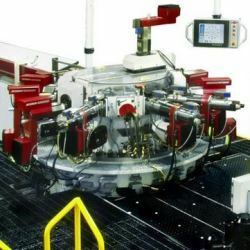 Up to 16 parts at a time are continualy automatically loaded, moved through each of the 16 independently automated machining stations, and unloaded. The barstock enters at the first station and is gripped by the first collet and sawed off. The first collet indexes to the second station to be machined while new barstock enters at the first station and is gripped by a second collet. The table indexes again, moving the first piece to the third station, the second piece to the second station and a third piece to the first station. This process can continue for up to 16 stations. 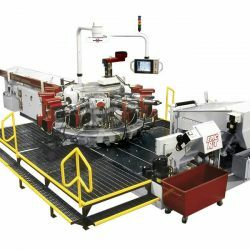 Due to the very nature of the machine, a rotary transfer machine can be customized to manufacture for virtually any industry that demands mid- to high-volume production jobs and quick turnaround. Liberty is always looking for used rotary transfer machines to buy for inventory. Contact us and let us know what you have for sale. We’ll be happy to give you a free quote. 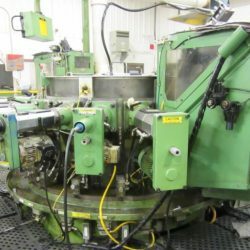 See our used Rotary Transfer Machines for sale.